Gardenias are in full bloom on the north side of our house. There are two shrubs each reaching over 7 feet tall. One can smell them from the street the scent is so intense. Gardenia then seemed a perfect choice for today’s vase. After several tries at combining gardenias with asclepias and calla lilies, I decided to regroup. 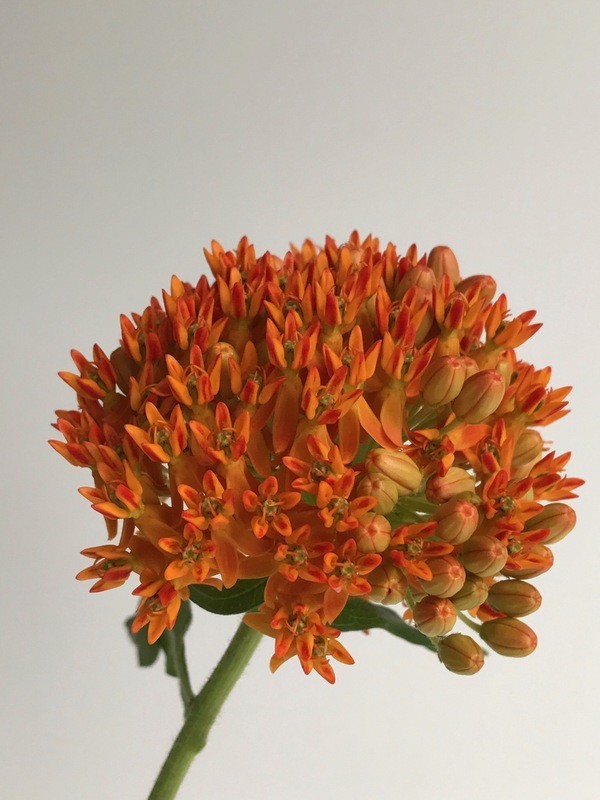 I separated the flowers and created two arrangements, keeping brightly colored orange asclepias in common with both. In the first vase gardenias and asclepias are inserted into a black floral frog that holds water. The frog in turn is placed into a new small gray footed dish with a graceful, sinuous curve. The second vase features my first ever Calla lilies. Foliage of Aucuba japonica ‘Variegata’ is used to highlight the yellow Callas. 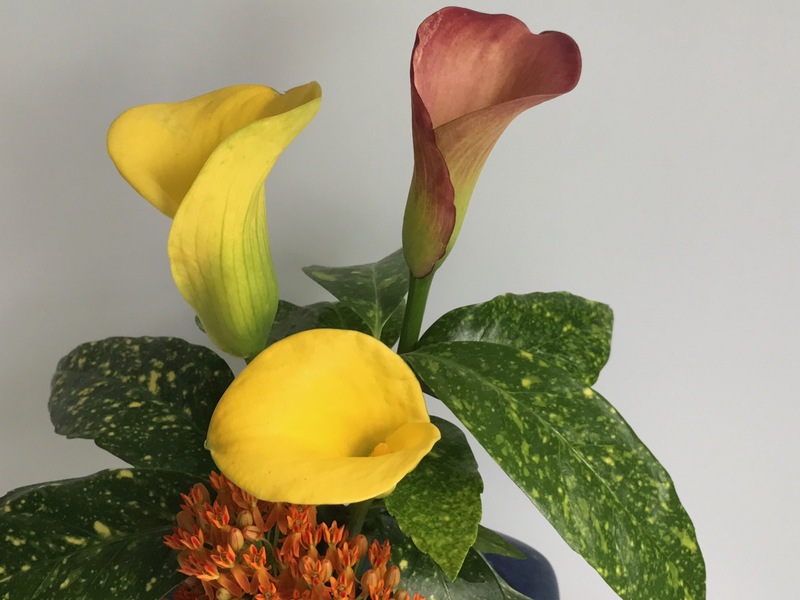 Of the three calla lilies that have bloomed so far from a package labelled ‘Orange Blend’, two flowers are yellow. The photo on the cover promised they would be more exotic, but I am happy they bloomed. The next few weeks will be busy away from the garden, on a special journey—an intense 200-hour yoga teacher training program. I am beyond excited. As my focus shifts I hope to be able to create Monday vases and continue reading your posts though I may not get a chance to comment often. Soon after the yoga training ends, the Garden Bloggers’ Fling will begin. This entry was posted in garden and tagged 2017vase, Asclepias tuberosa (Butterfly Plant), Aucuba japonica 'Variegata' (Gold Dust Aucuba), flower arranging, flower design, Gardenia jasminoides (cape jasmine), in a vase on monday, nature photography, Zantedeschia 'Orange Blend' (Calla lily) on May 29, 2017 by pbmgarden. Thanks Christina. The gardenias seem to do best with plenty of water (and we’ve had that this year), but now we’re getting quite hot temps so the flowers brown rather quickly. I was at Duke Gardens last Saturday with a friend and it was around 90F and terribly humid. We soon gave up. Reminded me of our day there a couple of years ago when it was 100F. How did we do it? Wow, those Gardenias are stunning! Mine are a much smaller variety, ‘Professor Pucci’ . Both the vases are beautiful. I haven’t seen that variety of Asclepius before, it’s fantastic. Do the monarchs like it? I tried orange Calla Lillies last year, a variety called ‘Inferno’. They were beautiful and strong and flowered for ages so I will try to get more. I hope your Yoga and Fling go well. 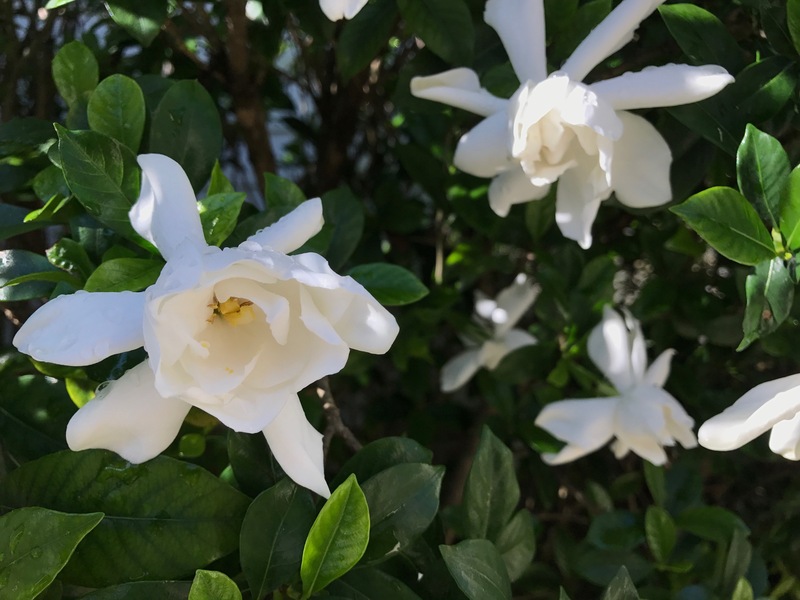 A neighbor rooted these gardenias in little yogurt cups and shared them about 15 years ago. Wish I knew the name. The asclepius is native to eastern North America. It looks like this is going to be a good year for gardenias. Yours are truly spectacular. Thanks John. Yes, I think all the rain this year gave courage to the gardenias. Oh, I’m imagining the scent! 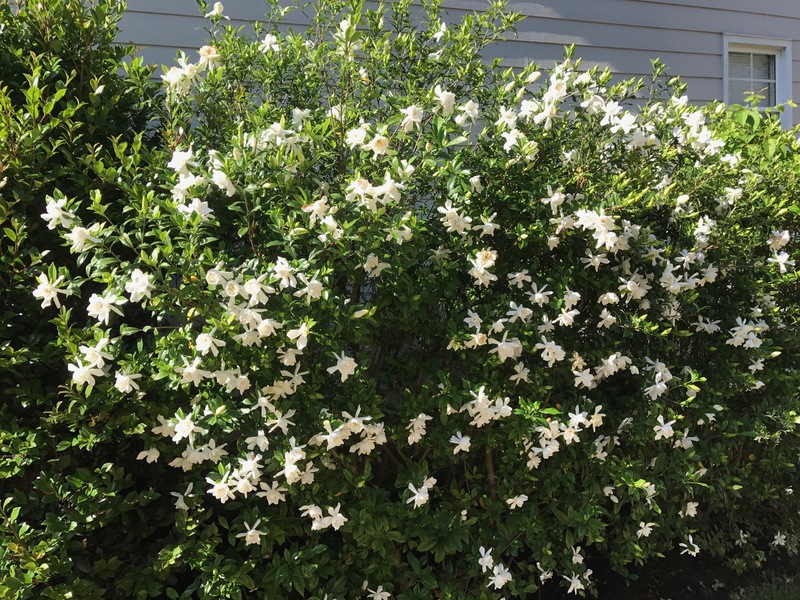 I’m envious that you can have a gardenia bush! They are the perfect foil for the orange. 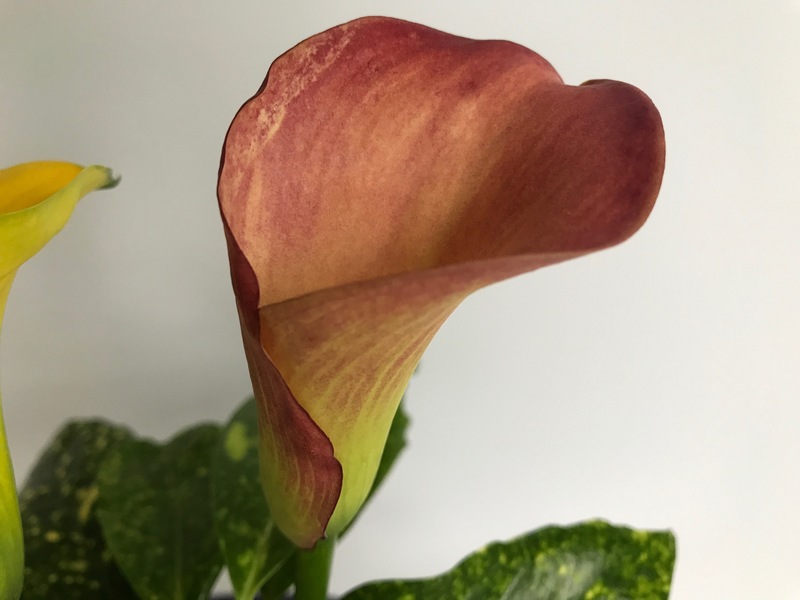 The dark Calla is definitely not orange but I do like it! They do smell wonderful, filling up the house. The callas are fun–will have to try some different ones. I just picked these up at a local box store this spring. I opened your page and gasped! 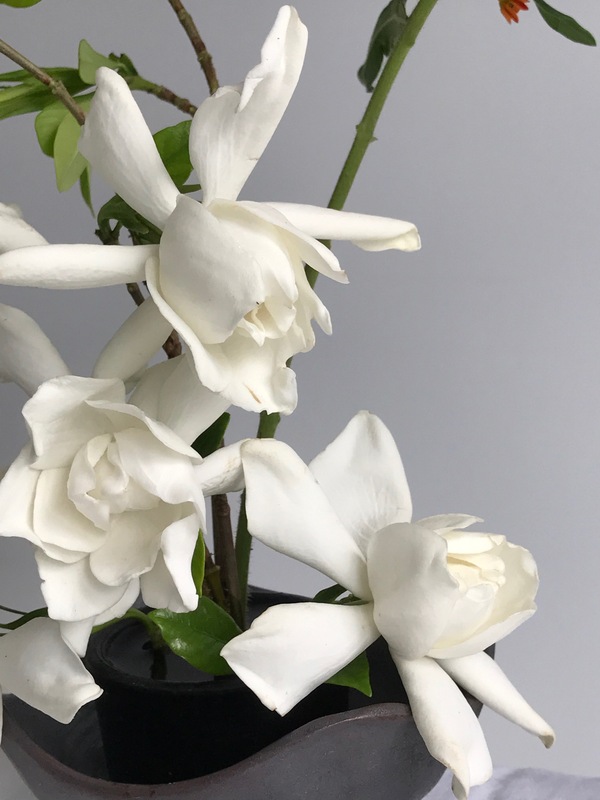 I am so envious of your abundance of gardenia blossoms – a favorite scent of mine. Alas, we are too far north for such pleasures, but I can enjoy yours vicariously. Lovely designs today, Susie. Thanks Eliza, wish I could send some fragrance adrift in your direction. Thanks Cathy. The gardenias were downward facing which made them hard to work with, so it did help to simplify the arrangement. The idea of yoga teacher training is daunting but I’ve wanted to take one for some time, mostly for self-improvement. I’ve not taught it before, but we’ll see. I don’t think I’ve ever seen that many gardenias in one place, Susie! 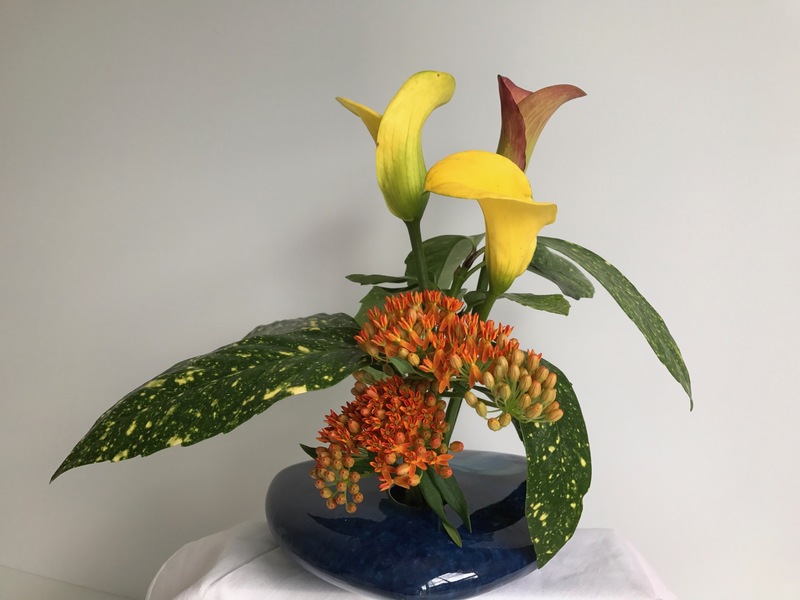 Both arrangements are lovelyalthough I admit a preference for the second one with the calla lilies – the orange blend lily couldn’t be more perfect in echoing the color of the butterfly weed. Best wishes with the yoga training and I look forward to meeting you in person at the Fling! The gardenias look the best ever so had to share that view. I will have to try more callas–they’re pretty fun to have for cut flowers. Hope they’ll continue to bloom as promised. Can’t wait to meet you in person Kris. Maybe we can get together for dinner one night. The gardenias are lovely, but of course I love orange flowers generally and butterflyweed especially. Orange flowers do make an impact, in the garden or in the vase. Your gardenias are fabulous Susie! I especially love the arrangement where you have used them – the new vase is lovely too. All the best with the yoga course – have fun! Thanks Cathy. The gardenias are just amazing this year. Such a treat. The little vase was an inexpensive find but it has nice “bones.” Looking forward to the yoga. Starts tomorrow. Gorgeous gardenias, I can almost smell them. The callas are singing to me though. Lisa, the callas are fun aren’t they? This is my first time growing them so it will be interesting to see how well they last. Love the gardenia and butterfly weed texture combination. Thank you. Yes, a stellar year for gardenias. We’ve had plenty of nice rain and I think they’ve enjoyed the extra water. May you return relaxed and inspired. Thank you. Two days in and I’m definitely outside my comfort zone, but enjoying it. Fabulous as ever Susie – I do love your style! 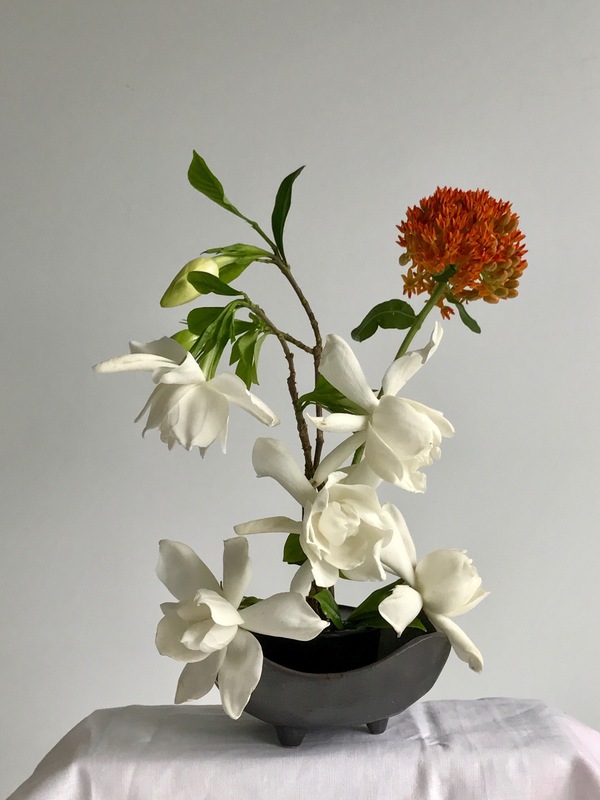 I am very jealous of your gardenia – that is something I could never grow in my garden – I am restricted to a tiny indoor version. Enjoy your yoga course – that sounds like an amazing experience & I wish you luck with the training. I appreciate your good wishes Julie. So far the yoga is challenging but fun. Glad I took the plunge and decide to try it. This is definitely a good gardenia year. Wow, those are some gardenias, so beautiful. I wish I could grow them in the garden here. The gardenias fade so quickly but these bushes are full this year. Also have some ‘August Beauty’ gardenias blooming profusely for the first time. They’ve been pouty in the past. We’ve had a lot of rain this year and I think they love it. The gardenias are lovely (I can almost smell them from here) but it is the second vase that gets to me. I have a Calla lily, ‘Flame’ that starts out yellow but deepens to orange/red over a long blooming period. Ricki, the gardenias are sensational this year. Your Calla ‘Flame’ sounds lovely.